The 2011 F18 Wolds are coming next week at Lake Balaton, Hungary, and the current F18 World Champion helm, Olivier Backes, tell us his experience on last year campaing with Arnaud Jarlegan (who is racing with Christophe Mourniac in Hungary ) and why he can´t be racing this year worlds. Olivier and Arnaud Jarlegan had an impressive run in 2010 ending in a World Title at Erquy. They showed that you need to train hard to achieve great things, but talent is also a key. 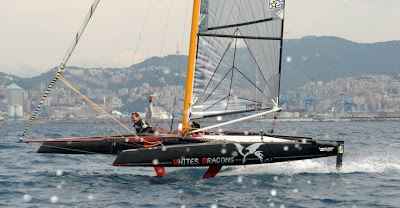 This Engineer, right now race at top level as a hobbie (double b) and you may think that in 2010 he just "took 2 weeks off and grab the 2010 F18 Crown" , but read on to realize that there is some serious sailing background in Olivier's career. - CSN:Tell us about your racing background on Tornado and when you started sailing. 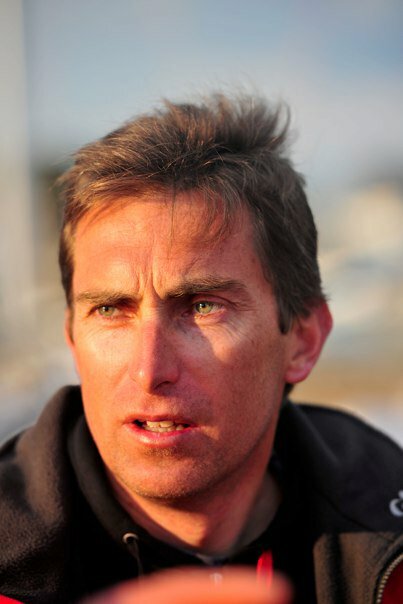 Olivier Backes: I was 7 when my parents moved to the mediterranean coast(close to Marseille), I started sailing during my holidays in every kind of boats available at the local club. From there on, I spent most of the weekends and holidays sailing, I just loved to be on the sea enojoying while all the beaches where crowed of people.. I started racing in optimist at the age of 9, then Windsurf and at 14 I finished with a silver medal on the French national in my age category. The Exteme Sailing Series will be finally broadcasted live, it was about time. I think John Casey will be reporting Live through SA OTW. Terry Hutchinson playing as local this time. What a rapid transition this guy has made, the same as Dean Barker on the A-Class or Spithill. No wonder they are some of the best sailors in the World. 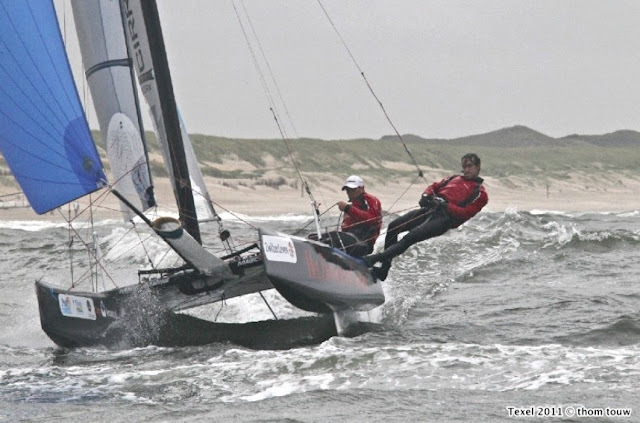 I'm sure now that there is no turning back for this new Multihull racing exposure, more when you have the top notch ex? monohull sailors excelling. Close to the large crowds and starting on time in every wind condition, the Formula 1 of sailing, the ultra fast Tornado catamaran held a total of 27 short, action packed races in a 7 day period during this famous sailing regatta. 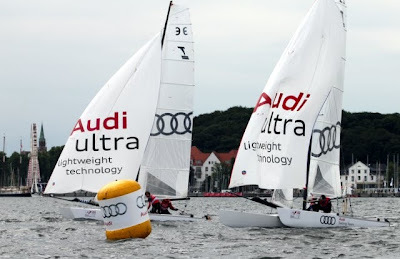 The Audi Sailing Arena was the only race course at Kieler Woche close to the land where the audience could get involved with the racing, seeing every move the sailors made. Live tracking was also provided for them to watch the progress on the big screen. The concept worked, even with the heavy shipping traffic passing through the race course. The audience were holding their breath while watching the manoeuvres the sailors made to avoid collisions adding more action and thrills. Every day German TV stations were creating reports on the Tornado in the Audi Sailing Arena. Unfortunately, the live TV reception antenna was hit by bad weather on the first day putting it out of action for the rest of the week. Before that the 8 Tornados were being streamed live onto the Internet. We also had the return of a Tornado legend, Dr. Rene Schwall for the second half of the week. He has not raced the Tornado since the Olympics and winning his bronze medal in Sydney. Lack of experience since 2000 didn't stop him taking victory in two of the races. Rene sailed with Odefey Maren, one of the many new female sailors in the Tornado Class. Since the announcement of a Mixed Multihull the Tornado Class has attracted many new female sailors who want to follow in the footsteps of Carolijn Brouwer, sailing as part of a Mixed Tornado team at the Olympic Games. 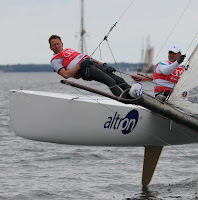 Winner of the Kieler Woche 2011 were the team of Heiko Soehl and Thomas Noll (GER), who sailed well throughout the series, a well deserved victory after 27 races. They were crowned champions just before the Saga concert. 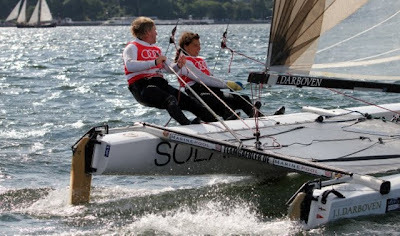 This team have already successfully sailed together for years and can now sail their career with a crowning victory during Kieler Woche. 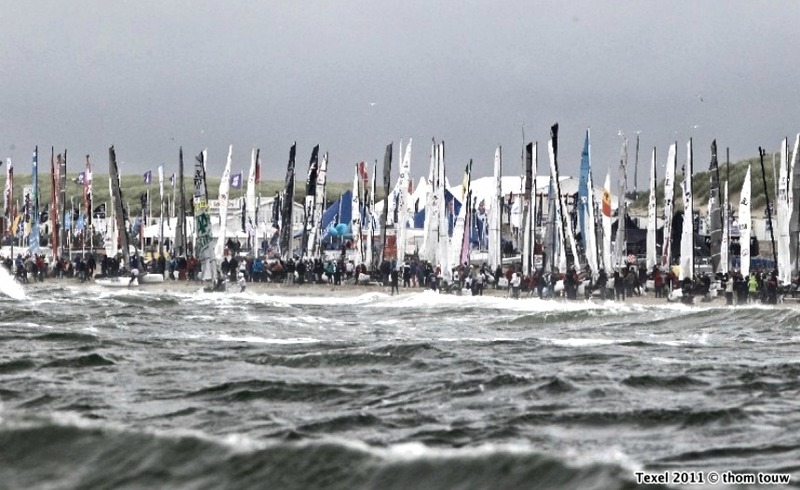 Overall the outcome of the Kieler Woche Speed Sailing was terrific. In every race the crowds were shown fantastic sailing action and entertainment. Together with Audi and the Kieler Woche partners and a dedicated team from the Kiel Yacht Club, we have successfully delivered a World premiere set to the spectators and media alike. It was a great success for all involved. Andrew Dowley - ITA Gral Sec. The other polish cat builder is being announcing their new A-Class for a while now. They are calling it 'Flying' too. Lets see what they have achieved, reading their tech data, it seems they've centered their work on the curved daggers, and Fischer told us about his lifting rudders too. 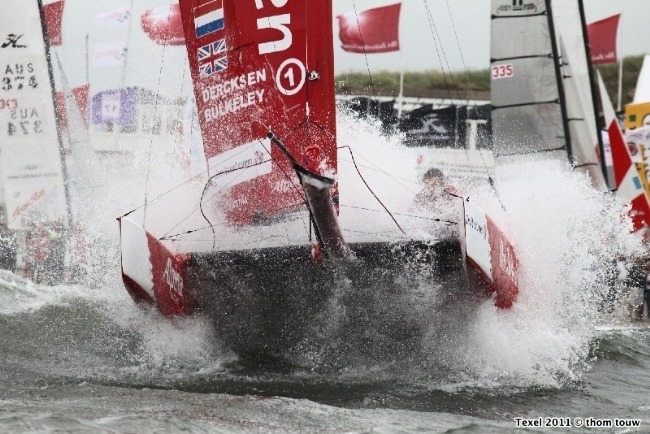 Lets wait for the launch and if they can reach August for the Worlds at Denmark. Good to see people going forward and pushing the A rules for innovation. They are also using Nomex against the 'MayFly' choice. Good technical info on their site, check www.wingfox.pl for more. From WingFox.pl: "When designing our new centerboards we focused our attention on selecting an appropriate profile thereof. Considering the fact that in majority of circumstances centerboards operate under transient flow, we decided to apply well proven profiles which at low resistance throughout the entire range of velocity provide high efficiency and are highly resistant to breaking of stream. In the ‘vertical’ section of the centerboard we have applied the NACA 63-012 symmetric profile which ensures generation of appropriate side force both at small and large speeds while at the same maintains appropriate rigidity. In the carrier section this profile turns smoothly into a non-symmetric NACA 63-412, passing through all the intermittent profiles: NACA 63-112; NACA 63-212; NACA 63-312. It must be noted here that this profile is capable of generating adequate lifting force as early as at 0 degree trim. Apart from high efficiency proven by computer simulations, the NACA 63-412 profile performs perfectly well also both in the large and ultra light units equipped with hydrowings. The choice of the NACA 63-412 profile constitutes and ideal consensus of low resistance at high speeds and generation of high lifting force in the entire velocity range." Didn´t have the time to publish it last week, but here it is. The Alter Cup 2011 on AHPC Vipers. What a good job AHPC and Red Gear Racing is doing in USA supporting the Youth Championship and the Alter Cup for the 3rd consecutive year. 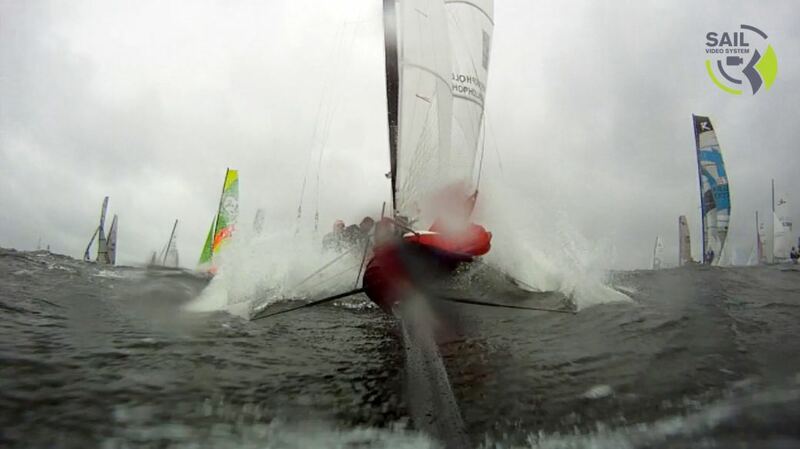 Report and images From US sailing. LONG BEACH, Calif. (June 18, 2011) – Skipper Matt Struble (San Diego, Calif.) won his fourth Hobie Alter Trophy Saturday afternoon on an exciting final day of racing at US SAILING’s U.S. Multihull Championship. Struble and crew Damon Lacasella (San Diego, Calif.) withstood a late push from Taylor Reiss (Panama City, Fla.) and Matthew Whitehead (Panama City, Fla.) to claim the title. 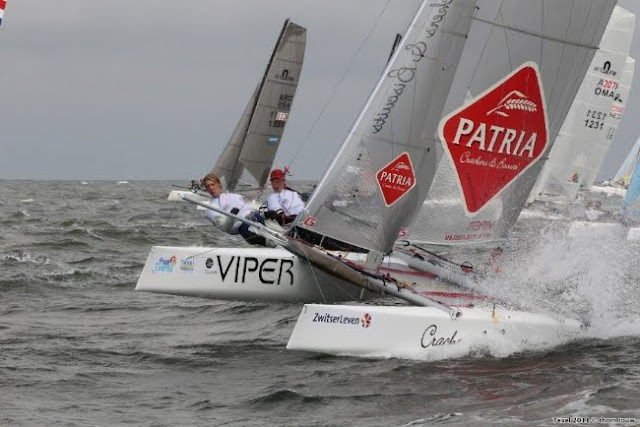 The 2011 championship was hosted by the Alamitos Bay Yacht Club and raced in Viper F16s on San Pedro Bay. Struble and Lacasella finished third and second in today’s two races, which was good enough to hold off last week’s U.S. 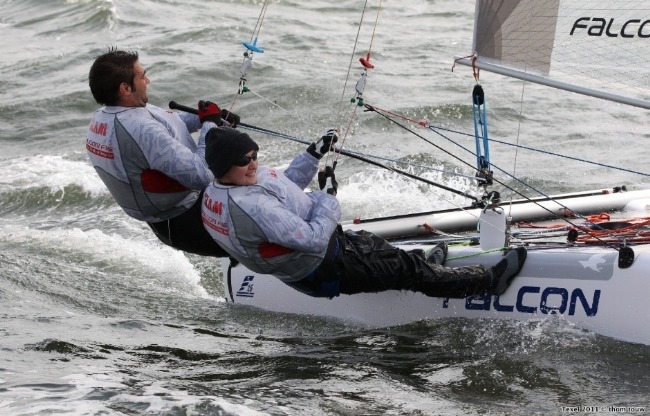 Youth Multihull Champions Reiss and Whitehead. The winners finished with 29 points through 11 races. They won by a point despite Reiss and Whitehead winning five of the 11 races, including four of the final six. Stronger winds prevailed Saturday, which suited Struble and Lacasella. Wind speed increased from 9 knots earlier in the day to 18 knots by later this afternoon. 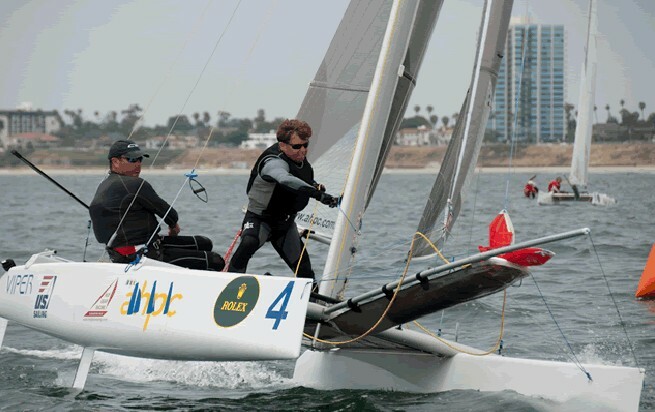 Struble has won all four U.S. Multihull Championships he has competed in. He won three straight titles from 2001 to 2003. Each title has been won with a different crewmate and in a different boat class. “I’ve never seen the Viper F16s before,” said Struble. “I didn’t set out to win with different crews. It just worked out that way,” he added. 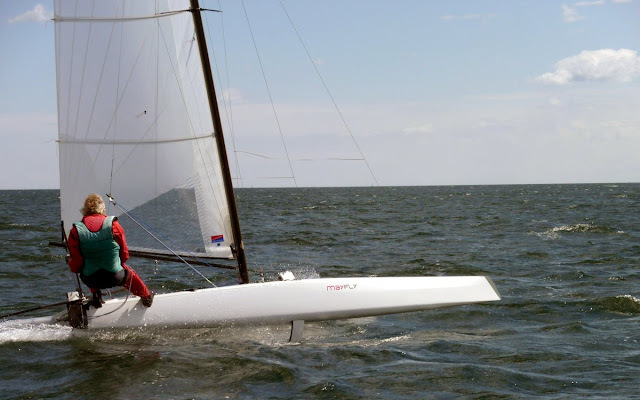 Struble attributes his personal sailing program and training in the A-Class Catamaran to his success, despite no previous experience in the F16. The 2010 A-Class Catamaran North American Champion is looking forward to competing in the 2011 A-Class World Championships in Denmark this August. Struble is also a former Iceboat World Champion. For final standings, recaps, photos and more, visit the event website at http://championships.ussailing.org/Adult/USMHChampionship.htm. 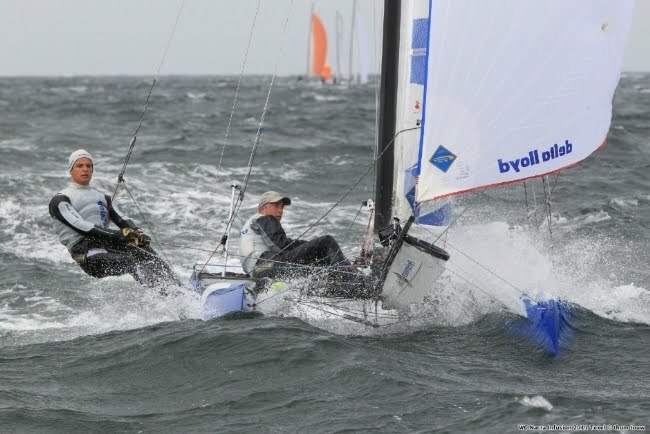 Many were racing at Kieler Woche and the Aussies are showing their class, the young Jack Benson was first followed by the experience of Andrew Landenberger. Landy will be racing the F18 Worlds at Lake Balaton too, after two years of absence. Good for the F18 and A-Class to separate their Worlds this time... more chance to getting sailors racing both. Waiting for a Tornado Class report to publish on Kieler Woche. No images no nothing beyond video clips from Kieler Woche website- Media page not working. Such a big event without available info is a joke. Edit: A short A-class video from Kiel , thanks to Thilo Keller for the link, check the subnormal way an unidentified dinghy (to me) capsize, that's sailing for sure... and 'beachcats are no serious racing'. This is a wrapup made by Sailvideosystem, the guys behind the live broadcast of the F18 Team Race. 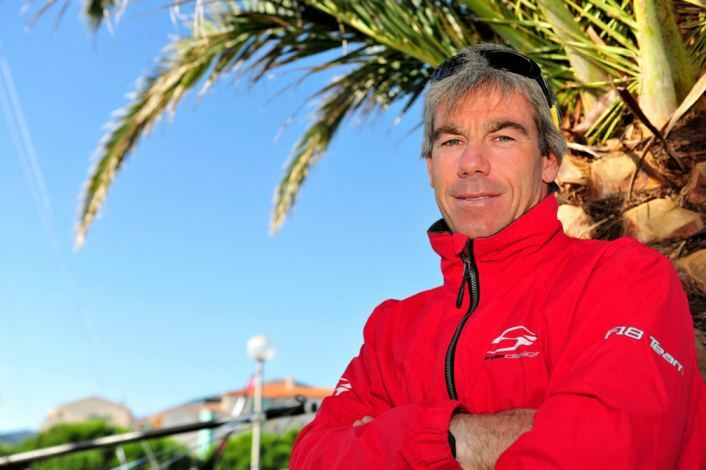 World Champ helm, Olivier Backes, cannot defend his title, although WC Arnaud Jarlegan will be there sailing with Mourniac, maybe this time Christophe can take home what he deserves after all these years of being so close at the F18 Worlds. Sail Innovation is proud to announce the venue of Kinou Mourniac in the team. 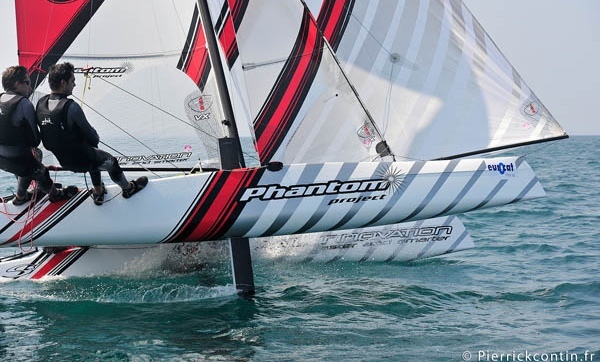 Kinou is joining us and will sail the F18 world’s with Arnaud on the Phantom. All the team is looking forward to work with him again, we had close collaboration several years ago on the sail development for Hobie. 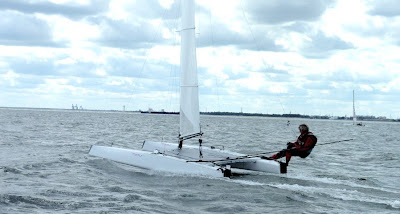 Kinou is sailing F18 since more than 10 years, he has participated to several boats development, his know how and experience will be very helpful to the team in order to continue the improvement of the Phantom project. I am glad to sail with Kinou. Our collaboration is positive and good for the Phantom project. The development takes us a lot of time but we are motivated. We want to take pleasure and bring our experiences together. See you in Hungary. I'm very happy to join the Sail Innovation Team and to sail with Arnaud. He is a fantastic crew. I'm very impressed by their new boat, the "Phantom". And I'm very motivated to join this new project and try to get a very good result at the Worlds. Unfortunately I could not sail this season (except Carnac for the first test of the phantom) but I am happy that Kinou could helm the boat for this season. Kinou is a very experienced helm, knows very well the f18, and with Arnaud, they will be one of the top team for the worlds next week. I wish all the best to Kinou and Arnaud for this championship!!! 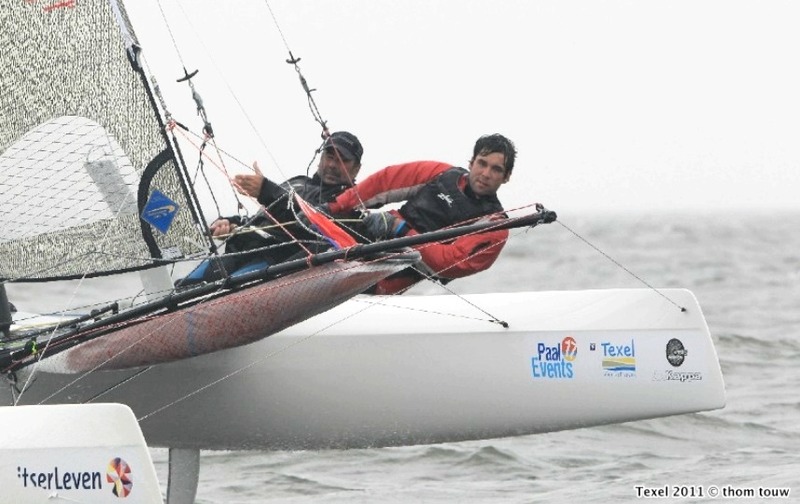 Mitch Booth and his son Taylor won the Texel Round Line Honours on a Nacra F20Carbon. The multiple world champ in the F18, Tornado, A-Class, Tiger and add now an F20c unofficial title, plus an Olympic medalist and AC34 leader of the China team, is still quite active. 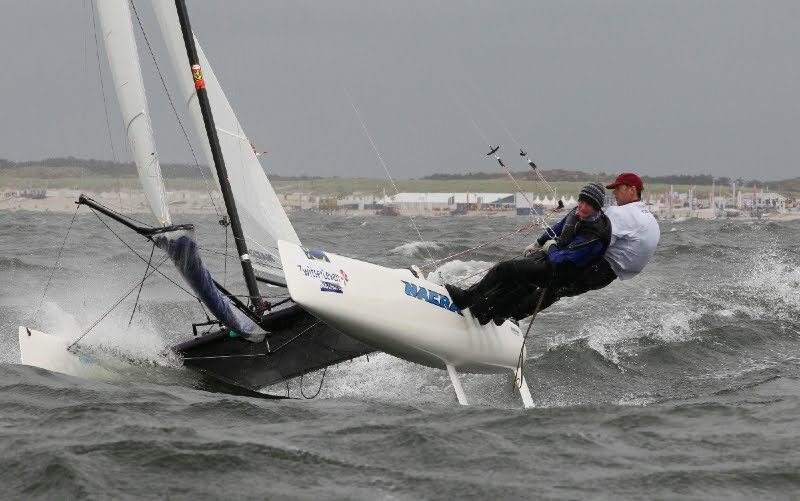 Winning the Texel is a proof of his talent, no matter how 'old' he says he is when he stayed on the beach at the Nacra Worlds when +30 knots were blowing the tents. 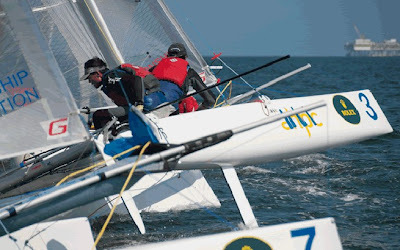 His legacy, the competition achievements, and the Tornado Sport conf plus the X40 project is quite alive in his son Taylor, a excellent catracing sailor too. Mitch is already a living legend of the sport, not many can have that honor. As posted before watch out for Mitch and his team for next AC at SF on the 72s. Carolijn and Jeroen suffered a serious crash on their Viper on the start and were out for the Round, Bundock was not racing this week. Herb´s M20 Winged was 14th, and for sure a good 1st experience. 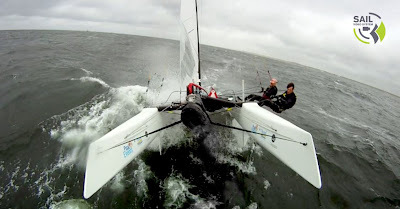 Right now the Nacra F20 Carbon is dominating the scene, a change of guard over the Ts and the tuned M20s, although previous Texel winner on a Marstrom, Wiliam Sunnucks, had an accident too on the start. The Tornado, with Hendricks-Godefroid, still showing her speed after 30 years with a 5th overall behind the F20c and ahead of the best F18s. First Mixed crew, Sproat-Burke on a AHPC Viper. On corrected time, Mischa Heemskerk and Bastian Tentij on their Cirrus R won over Coen de Koning and Thijs Visser , the Booths were 3rd. The Arg team was 15 overall and 7th on the F18 , but they crossed the finish line on the wrong side and were disquaified!! nevertheless an impressive task for the argies, and some here are asking theirselves why they didn´t went this time to F18 Worlds, as although Cruz and Mariano are one of the best of the local fleet and 2010 champs, we have at least right now 3 more teams on the same or even higher level. 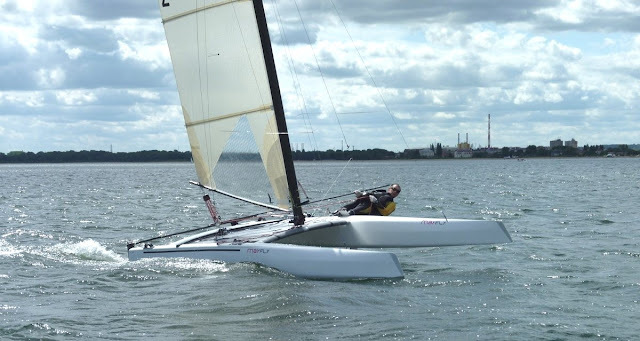 Gunnar Larsen saw it first hand when he was in BA, and he agreed there is no joke racing in our local conditions, and learning to sail here gives us some basic advantage when racing more forgiving venues. 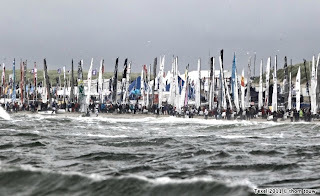 The guys were reporting a 3X times an F18 Worlds scene, the Texel Round is the biggest catmaran racing event in the World, 500 cats, what a Race. They are sailing against Professionals that have been racing cats all their life. They are racing on a rented 2007 Infusion with the MKII upgrades, Simon Northrop, finally 12th, is racing with a 2006. 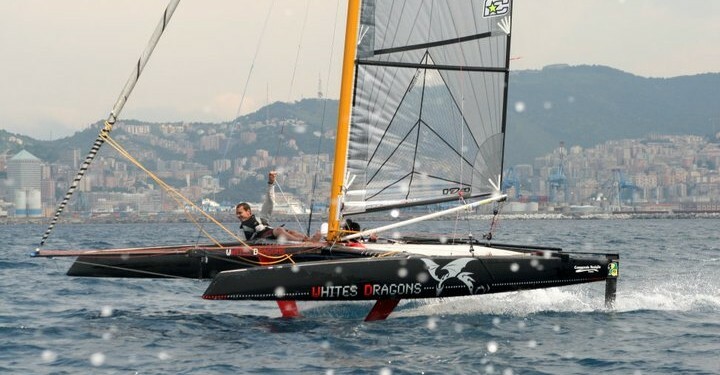 Cruz Gonzalez Smith has been sailing F18 (or cats for that matter) with one of the first Racecat series since 2008 and Mariano Heuser some months later. One with a good club Laser campaign and the other coming from Windsurf-Kite kite scene. At the Nacra Worlds they had several issues and breakages, but they were fast as the races finished were some 3,4,7,8, 9 all top ten. 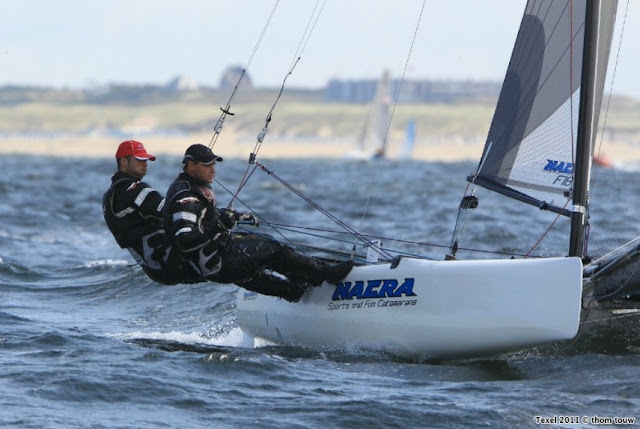 Now at the Texel Dutch Open they couldn´t start the two first races scoring a double 91. This after 3 bow sprit breakages, plus a boom, and several others cracks on the hulls due to collisions, and also a really bad news for Mariano, as he was informed just before racing yesterday that his home at BA was emptied by some 'uninvited guess' wtf!? truly sorry for him. It seems the last races they were sailing 1 on 1 with Mischa-Bastian and Coen-Thijs, two of the most talented crews... but to have a perfect end of a powerfull and rough week, they provided the Texel crowd with one of the most incredible wipeouts captured on film ever! breaking a great part of the Infusion. Congrats to Cruz and Mariano for showing high guts all week, even after some bad vibes from all over, as they did in last Arg championship where they dropped mast, missing two races, and coming back for the last one to take the 2011 Championship . Best of luck to both for the Worlds. Hope they can stay, Cruz was 23rd at Erquy, lets see what they can do at Lake Balaton. Mariano repairing one of the several crashes on their boat. Dercksen-Bulkeley Marstrom 20, Winged. The Extreme 20 as they call her.Excellent photo by Hobie F18 racer Mischa de Munck, click to enlarge, this will become a classic pic in the future. Left some detail images sent by the Arg crew (Cruz Smith-Mariano Heuser) that is racing the Nacra Worlds, the Texel races , the Round and the Hungary Worlds for a full on racing trip. More on them tomorrow. 'Normally you can take it easy when you're in the lead, but with the handicap rules you have to continue pushing. The F18 seems to go down one point every year, for whatever reason. We started with a rating of 105 and this year we already have 100. When I started sailing the Tornado had 100 and that boat was really fast. The F18 class rules haven't changed, but the handicap keeps going down." The lower the rating, the faster the boat should perform compared to cats with a higher rating. Interesting to note what Mischa is saying about the F18 Texel rating going down every year to match the Tornado 100?? Folding racing Tri. Uptodate design with good volume amas. This looks like a weapon too. Congrats to Tim and the Seacart team for this new project. Simon Northrop is one of the faitfull readers from England, reading a catsailing blog made by an Argie that writes in English (or at least try...je) that's the good thing about internet and global connections. So just today, exactly 25 years anniversary of the 1986 epic football match between England and Argentina where the two most famous goals ever took place, an 'old' good English catsailor is getting some good exposure after an excellent first day at the Texel Open. Congrats to Simon and Charles for this great start. Coen and Thijs are working hard to be on top again, they always are in the podium, but I'm talking being champs. As superior racers no wonder they tried to innovate riding without a Jib!! First ever in the F18 history??? They had margin on discards, but nevertheless a bold move. Will get the guys for some feedback on this. the concept might be that with too much wind, as they did expected, the jib gets too much drag over the power provided. I'll ask Thijs how they felt that innovative setup for extreme conditions. 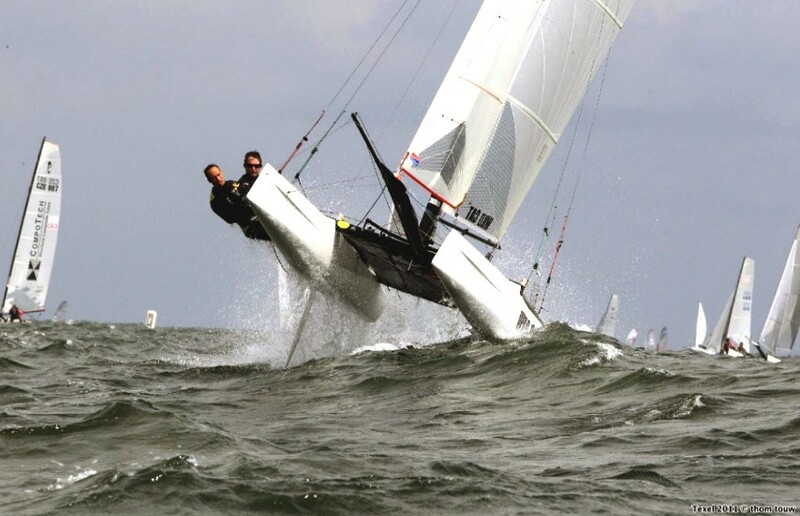 Best of luck to them for Lake Balaton in Hungary for the 2011 F18 Worlds. The Round Texel / Zwitserleven Week website is quite good, check it for complete daily updates, photos and videos. Congrats to the the guys behind this project. What is not getting better is people sending mails with annoying attitude demanding to publish their info. And not precisely the ones behind (everyday) this excellent project. This is just a blog, I try to publish every single mail I receive. Basically I post the things I like, WD is one of them, but this week is Texel week and other projects I had in the log. So please don´t get mad if you are not published right away or not published at all. For instance, the Alter Cup was raced this week and I couldn´t yet make a full report, and it is a championship of great importance, and no one wrote complying on it. Will make a report next week. If you want a constant presence on the blog you just have a banner as Landenberger did. All good, but again, I like to maintain the blog but is taking me lots of hours and is getting more like a pro bono work when I receive this kind of demanding requests! You keep sending mails, when I have the time I will publish them, if not published send it again, but please , good vibes only, if not go to SA they have a wider reach. I had this photo from Macca sent to me by Grantly Pellew 3 weeks ago, but I didn´t had the 'ok'* to publish from Andrew, so here it goes. Is this the Ultimate 'beachcat' racing machine???? Photo above: Coen and Thijs pushing hard, something the Infusion (Pete Melvin desing) allows you to do in a big way. 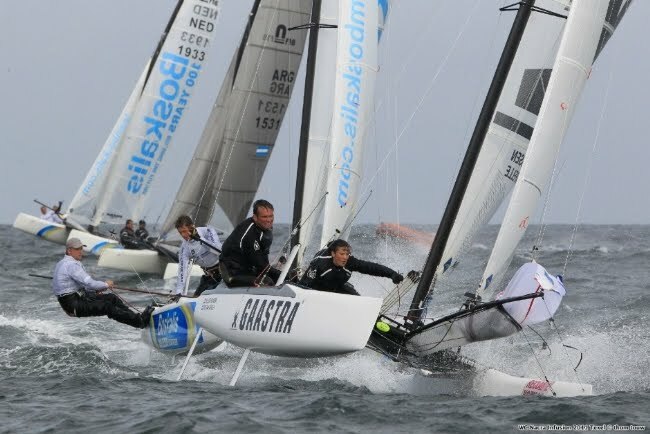 The 2009 F18 World Champs with a comfortable lead over Larsen/Frank and Grant Piggot/Garcka. The Arg crew with highs and lows, scoring 3,4,7 on the races they could finish and severl dnf, dnc to some breakages. 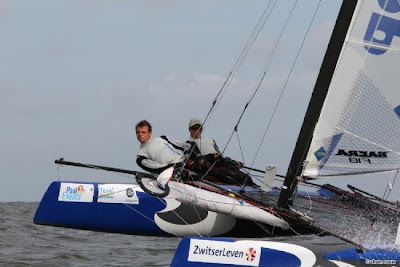 Coen and Thijs puching hard in every regatta, the pair seems really focused to regain their crown at Hungary. 'I am too old for this", says Mitch Booth with a smile. He watches the action on the North Sea, but dressed in wall clothes and with dry hair. 'Let's say we are preserving the boat for the rest of the week, or is it the helm?" He didn't race today, but the runners up Xander Pols and Sascha Larsen did. Pols: 'We could double the rest of the fleet. I think we were the only one who hoisted the spinnaker. It was pretty extreme. The waves broke at the top mark. The main reason why we went out today, is to test the boat in these conditions. We wanted to know whether the Nacra 20 performs in stronger wind as well and she does." Booth and Witteveen are still leading, followed by Pols and Larsen. Well, what can I say? if you are interested in high performance flying cats, just read this doc by Martin Fischer, lot to digest and check the construction notes. The name indeed (as ponted by a reader) is to honor a previous design, read on for more. Over the weekend I was in Poland and we tested the Mayfly. We had 3 Mayflys on the water and there were about 6 or 7 other A-Cats. The wind was shifty and gusty between 12 and 18 kts, the strongest gusts mayby 20 kts. Downwind the MayFly was clearly quicker than the other boats. With the MayFly it was possible to do the downwind course on the trapeze, whereas the others were already limited du to nosediving. The speed difference was very clear. Upwind the boat speed was good, as quick as the others, sometimes may be quicker, but not as superior as downwind. The MayFly is a new A-Class Catamaran design. 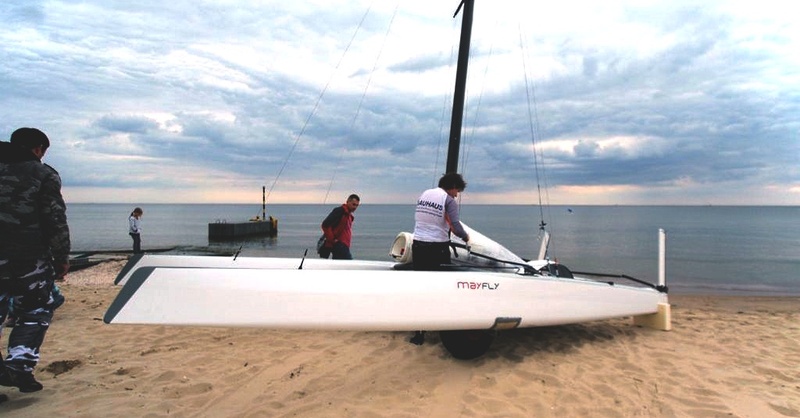 The boat was designed by Martin Fischer, with important input and help from Jakub Kopylowicz and Woitech Kaliski. The structure of the platform and the foils was designed by Ryszard Partycki. Jakub, Woitech and Ryszard are the people behind the Exploder catamaran range and Martin is known for his F18 designs Capricorn and Wild Cat. 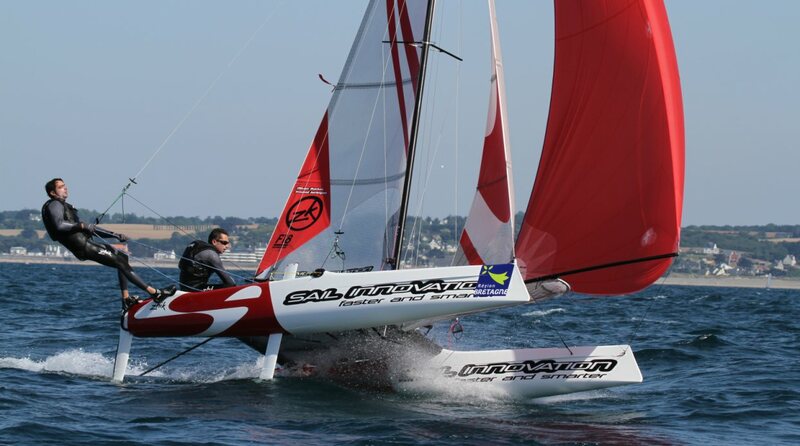 The name of the boat is a tribute to the first successful singled handed flying catamaran named “MayFly”. She was built in the early 70’s and the boat was sailed with great success by Philip Hansford and Ben Wynne in the mid 70’s at Weymouth Speed Week. Over the last years the hull volume of high performance beach catamarans has significantly increased. Designers found that wider hulls allow pushing the boat harder in stronger winds but don’t slow them down in light conditions. With the design of the MayFly we have of course followed the same direction. The boat has very flat cross sections, little rocker and a very high prismatic coefficient (lots of volume in the extremities of the hull). This provides for good longitudinal stability and reduces pitching, which is always a problem with the extremely light A-Class catamarans. Today A-Class boats are highly sophisticated designs, and in our opinion it is no longer possible to find a design that is in all conditions faster than the other designs. It is therefore necessary to make a choice in which kind of conditions one wants the boat “to shine”. We made the choice to have a boat that performs very well in medium to strong winds and we were ready to sacrifice slightly the performance in the very light stuff. We ran numerical simulations of longitudinal stability and hull drag for a number of hull shapes and compared them to two existing A-Class designs. The graphs below show the relative drag difference of the tested hull candidates with respect to a reference hull (existing A-Class). Values below zero indicate lower drag and values above zero indicate higher drag. Figure 1: Relative hull drag differences for different hull shapes with respect to the reference hull „l_07“ (horizontal line at y=0) as a function of boat speed in knots. The simulations were made for a total displacement of 150 kg while the boat is sailing on one hull. The horizontal line “l_07” at 0.00% represents the reference hull and the blue line “ref_02” represents a second existing A-Class hull that was taken as a second reference. 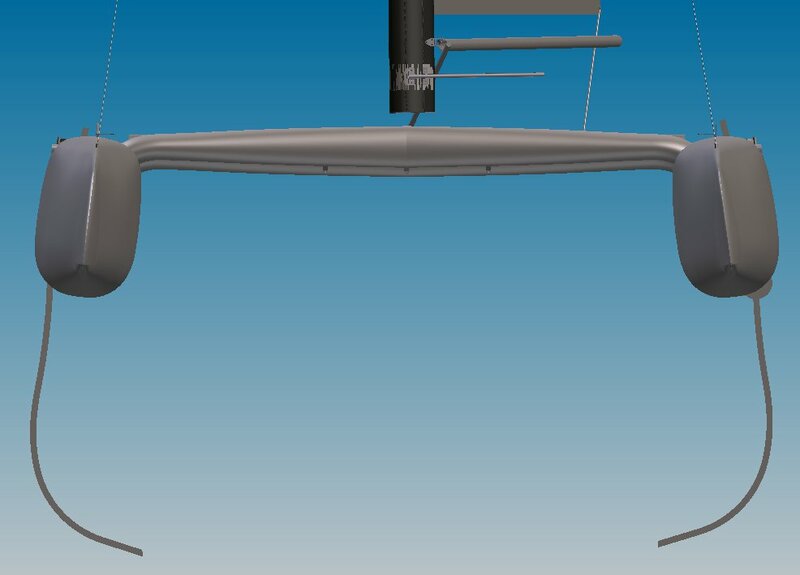 All the new hull candidates were designed to have the same longitudinal stability (resistance against pitch poling), which is significantly higher than the longitudinal stability of the two reference designs. The figure shows that all the candidates that were tested have significantly more drag at boat speeds from 0 to 5 knots. 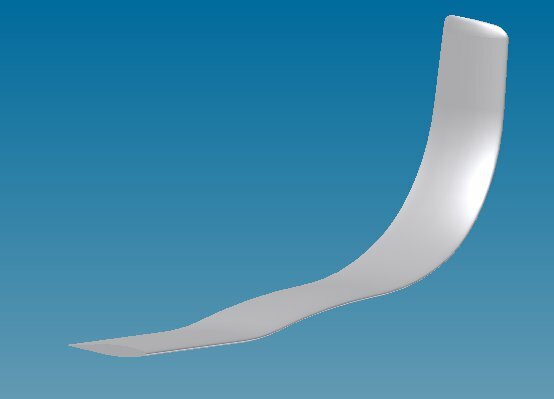 From 5 knots onwards, however, the new hull shape creates between 1% and 1.5% less drag than the reference hull “l_07”. With respect to the reference hull “ref_02” the crossing is also at 5 knots of boat speed, but the advantage at higher speed is significantly bigger. An A-Class catamaran achieves a boat speed of 5 knots in about 3 to 4 knots true wind speed (TWS). Thus according to the results shown above our new hull shape should be very competitive from 3 to 4 knots TWS onwards. The cross over with respect to “l_07” is shifted to slightly lower boat speeds – about 4 knots – and with respect to “ref_02” it is even at 3 knots. Furthermore the drag gain at higher speeds is even larger than for 150 kg displacement. 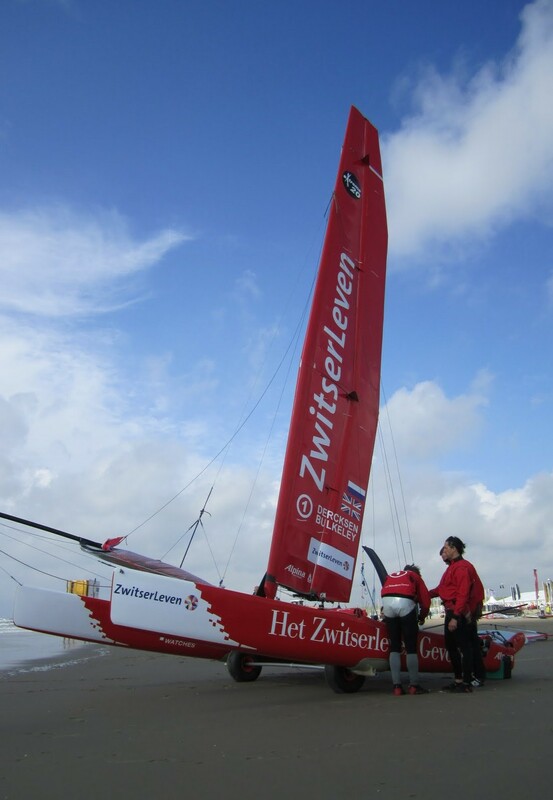 From these results we are confident that our boat will perform well from 5 knots of true wind speed onwards. In the very light stuff the boat might struggle at bit, but this can probably be compensated with slightly fuller sails. It was already mentioned in the previous section that the boat is equipped with curved foils and with lifting rudders. We won’t go into details on the foil and rudder design, just a few hints: The radius of the foils is not constant and they are twisted. The size of the foils and the rudders was set such that they provide a stable configuration for pitch and sinkage variations. Such a configuration enables stable flight in stronger winds, without the need fors a mechanical surface sensor as used on the Moth. We have filed a patent for this type of configuration. The platform set-up was entirely developed by Jakub Kopylowicz. The boat features curved cross beams that are glued into the hulls. Thus the deck is completely free of any obstacle. Water passes much easier over the deck and the helmsman can sit anywhere much more comfortably, which is an advantage on downwind courses in very strong winds. The curved beams were designed (shape and structure) by Ryszard Partycki. Furthermore he was in charge of the structure of the hulls and the appendages. The deck layout is very clean, and the Harken traveller rail is integrated into the deck. Cunningham, mast rotation and daggerboard control can be adjusted from the trapeze. The hulls are entirely built in carbon epoxy with a foam sandwich. The whole hull layup is made with unidirectional tissues. The outer and the inner skin of the hull are made of two layers of UD tissues, oriented at varying angles with respect to the longitudinal axis of the hulls. This provides for better longitudinal and torsional stiffness than hulls built from woven fabrics or biaxial fabrics. We considered building the hulls with a honeycomb sandwich but refrained from it since it is difficult - and expensive in terms of weight - to ensure water tightness of the very thin outer and inner skin of the hulls. Using Nomex honeycomb instead of PVC foam saves about 1kg per hull. However, in order to be sure that water cannot penetrate into the honeycomb core it is necessary to seal the inner skin and to put additional paint onto the outer skin. Thus the total weight of a honeycomb A-Class hull is more or less the same as for a foam hull, with about the same stiffness. But a foam sandwich is more robust than a honeycomb construction which led us to the decision to use foam. The hulls are built with 7 bulkheads and for superior longitudinal stiffness we used high modulus UD carbon layers. The curved beams are a sandwich composite construction without dolphin striker. 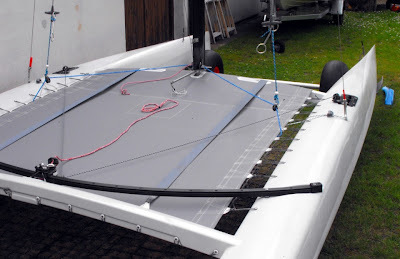 The boat comes with a Fiberfoam carbon mast and with Landenberger sails. It is of course possible to choose a different mast or sail. 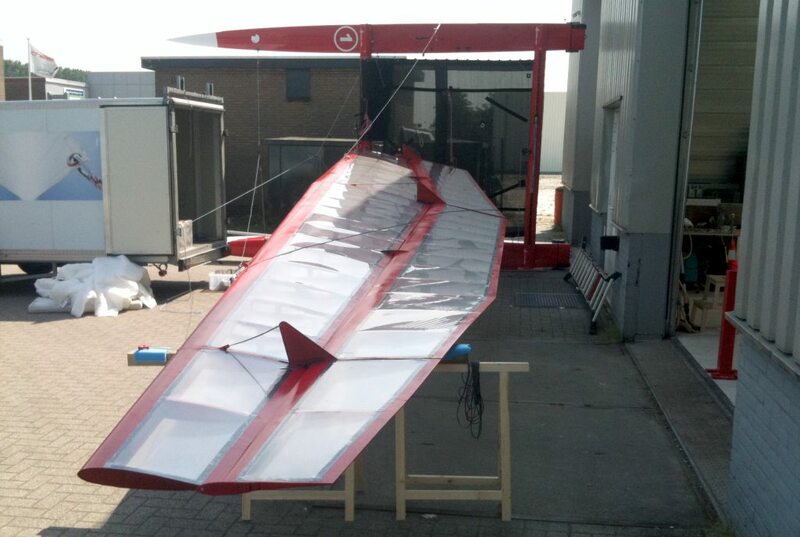 We are also working on a wing mast that represents about 30% of the total sail area. First tests have been made but it is too early to draw any conclusions. Coen de Koning and Thijs Visser are the early leaders of the Nacra Infusion Worlds 2011, sailed off the Texel beach in the Netherlands. 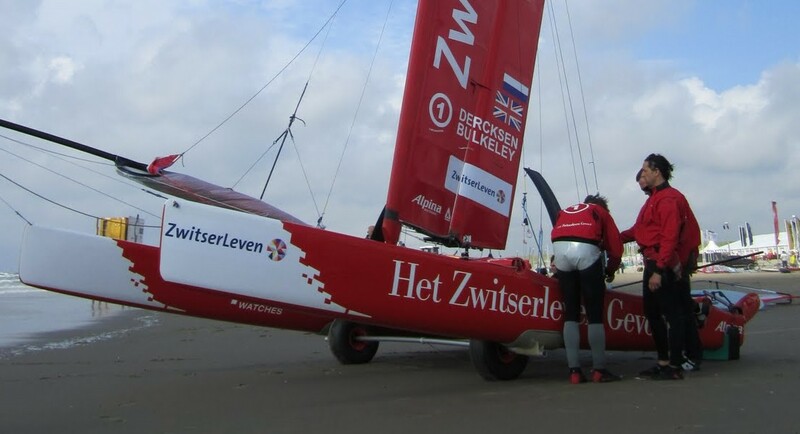 De Koning/Visser like 'technical breeze': 'It was a technical breeze with on and off trapeze conditions and oblique waves on the course", said Coen de Koning from the Netherlands. 'In the first race, I still had some problems with it, but afterwards we won pretty easily. We did not lead from the beginning, but we just sailed a bit smoother in terms of tactics and speed." The F18 World Champions of 2009 scored a third after the lunch break, followed by another victory. De Koning: 'Sometimes we could double trapeze, sometimes not. It was important to look for pressure and stay in it." It was a long day with five races, so felt De Koning: 'I am looking forward to my bed." AC 45 skipper Mitch Booth (AUS) showed up at the very last moment and unexpected. A change of training schedule with Team China allowed him to compete in the Int. 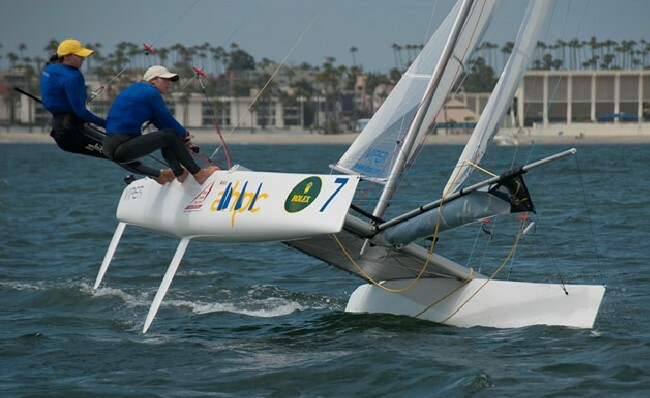 Nacra Championship with the Nacra carbon 20. 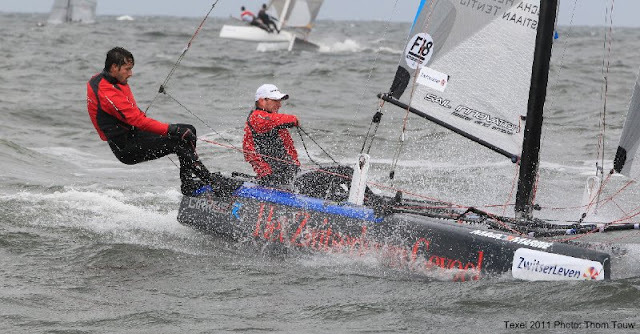 He and his teammate Olivier Witteveen (NED) had a close matchrace battle with Xander Pols and Sascha Larsen from the Netherlands. The pair of teams dominated the fleet of six cats, with Booth and Witteveen winning the bullets. Booth: 'You notice there are different levels in the fleet. For a lot of sailors the circumstances were difficult. There wasn't a lot of wind and the waves were higher than you would expect with this breeze. So if you are a moment not really focused than you loose a bit."